©1998 ERSATZ AUDIO. Published by Ersatz Music, ASCAP. The debut 12" single from ADULT. 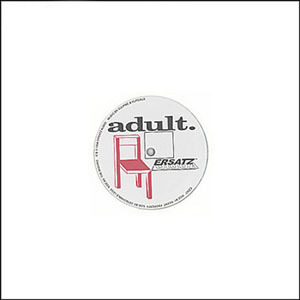 "Dispassionate Furniture ep" on Ersatz Audio contains 5 original tracks, each one dedicated to the estranged relationships that develops between furniture and their masters. The moveables in our homes that we walk by each day not noticing, until they refuse to be ignored. The lyrics tell the tales of ergonomically inhumane encounters, while the music pushes us to the limits of synthetics. Electronic sounds that prepare us for our nonstop imminent encounters with dispassionate furniture. So please, sit back in your most uncomfortable chair and prepare to hear the forgotten sounds of the future - our obsession with tomorrow. This 12" is out of print.